The Chinese yuan is weakening to kick off the trading week as a state-run newspaper anticipates economic growth to slump to a historically-low level in the first quarter. Investors are also combing through the latest forex exchange reserve data. According to Economic Information Daily, a newspaper run by the government’s Xinhua news agency, the Chinese economy is projected to grow just 6% in the January-to-March period, which would be the lowest on record. Should these estimates come to fruition, quarterly growth would slip below the last quarter’s reading which was the lowest since the global financial crisis. Last year, gross domestic product (GDP) advanced 6.6%, the slowest annual growth in 28 years, before the nation commenced its journey to one of the world’s largest economies. The People’s Bank of China (PBOC) reported on Monday that foreign exchange reserves climbed more than expected last month. The central bank said that the country’s forex reserves climbed by $15.2 billion to $3.088 trillion. This represents the biggest increase in a year and it beats median estimates of $9.3 billion. China noted that the modest jump in its reserves was because of an appreciation of non-dollar currencies and increases in the prices of financial assets it maintains. Over the last year, the PBOC reduced banks’ reserve requirements ratio (RRR) five times, and analysts anticipate additional cuts in the coming months. Meanwhile, traders will be looking ahead to more monthly factory activity measurements. The leading surveys have found consecutive contractions and many businesses have posted profit warnings. 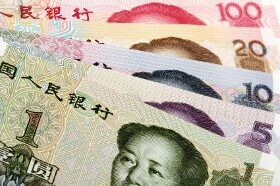 The USD/CNY currency pair surged 0.71% to 6.7924, from an opening of 6.7448, at 17:22 GMT on Monday. The EUR/CNY rose 0.06% to 7.6540, from an opening of 7.6496.